Qiu Ying, landscape — Sydney L. Moss Ltd. Signed: Qiu Ying Shifu zhi 仇英實父製; with two intaglio seals of the artist: Shifu and Shizhou xianshi. A hanging scroll landscape in colours on silk, circa early 1540s. Painted area: 116 x 58 cm. Qiu Ying, zi: Shifu, hao: Shizhou, was born and died in Taicang, Jiangsu, but spent much of his working life in Suzhou. He was one of the Ming dynasty’s most accomplished, versatile painters, regarded since the late sixteenth century as one of the Four Masters of the Wu School, and more commonly the Four Great Masters of the Ming, with Shen Zhou, Wen Zhengming and Tang Yin. From a humble family, at some point in early adulthood he went to study under the great Suzhou painter Zhou Chen (1450 - ca. 1535), who also taught Tang Yin. 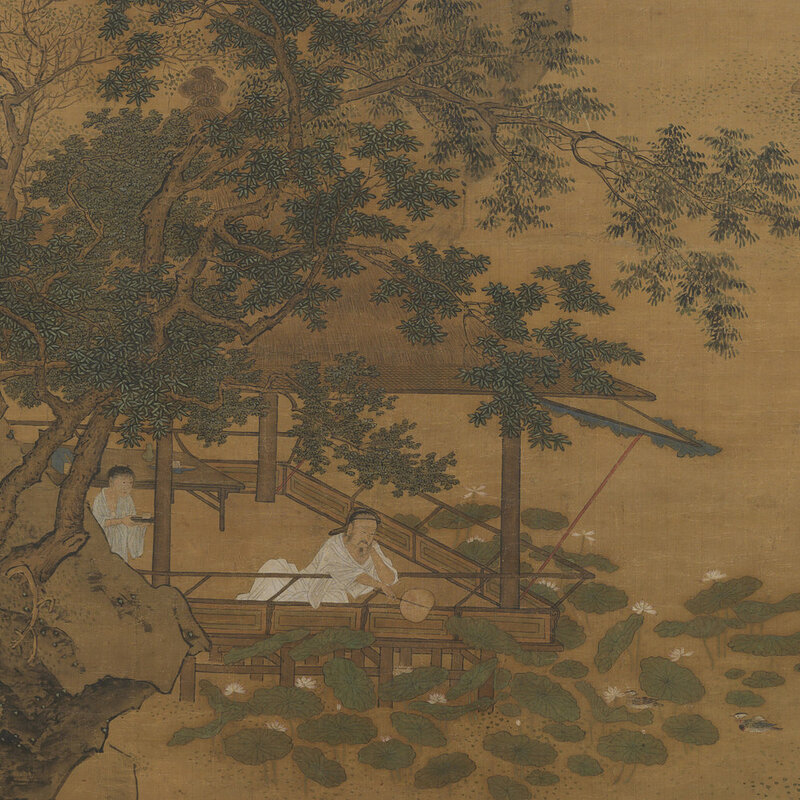 Qiu stayed with Zhou from perhaps as early as 1517 until about 1530-31, when his talent became widely recognised. The artist's rare second seal, Shizhou xianshi 十洲僊史, also appears on an album leaf in the Palace Museum, Beijing, Mingfei [Wang Zhaojun] Passing the Frontier 明妃出塞, and Qiu Ying’s Hunting on an Autumn Plain hanging scroll in the Liu Haisu Museum, Shanghai, which can itself be directly tied to the period during which Qiu Ying was enjoying the patronage of Zhou Fenglai 周鳳來 (1523-1555) of Kunshan; a period considered to be Qiu Ying's middle period. This painting can be tentatively dated to the early 1540s.